When you create your Facebook Fan Page, you are given an option to make your fan page publicly visible. 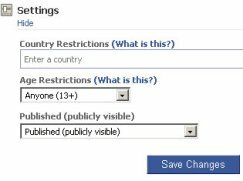 If you don’t select the option to make your Fan Page publicly visible it will remain in an “unplublished” status until you change it to public. Having a Facebook Fan Page typically implies that you are trying to reach and grow an audience of fans that are interested in what you have to offer. But if your page is not publicly visible, then no one will be able to find it on Facebook – and that can be a huge problem. Once you’ve completed the steps above, your Facebook Fan Page will become publicly available and accessible to anyone searching for it or trying to find it. Hope that helps, and let me know if you have any questions below in the comments! I tried this and my page is still not showing up publically. Any suggestions? Hey Amy- make sure that your age settings are 13+ – mine was automatically set to 18+ and this meant that they had to log in to view the account. I have had such a headache over these stupid facebook pages it makes my brain hurt.